The first Bulgarian stamps were issued in 1879. These beautiful multi-colored definitive stamps were very unusual, considering the printing technology of the time. The new definitive stamps featured a heraldic lion as their central design, and philatelists refer to them as the "Lion of Bulgaria Definitives". The autonomous Principality of Bulgaria was created in 1878, as a result of the Russo-Turkish War. They were still a client state of the Ottoman Empire, but in effect, they were completely independent of Ottoman rule, even conducting their own foreign policy. In 1878, the new principality adopted the French Franc as their currency. In 1881, Bulgaria implemented its own currency, the Bulgarian Lev (ЛЕВ), with 100 Stotinki being equal to 1 Lev. The name of the new currency was very appropriate. 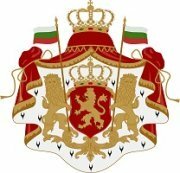 In Old Bulgarian, the word "LEV" means "LION", which is the heraldic symbol of their nation. 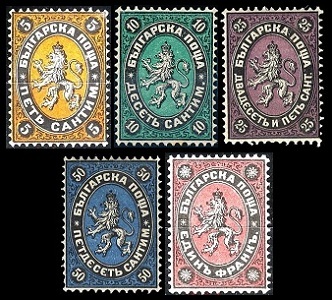 The five definitive Bulgarian stamps shown above were issued on May 1, 1879. They are typographed on laid paper that is watermarked wavy lines and Cyrillic letters in the sheet. These first definitive stamps are denominated in Centimes (САНТИМ) and Francs (ФРАНКЪ). 05 C. (1879 - Sc. #1) - Black & Orange, Black & Yellow. 10 C. (1879 - Sc. #2) - Black & Green. 25 C. (1879 - Sc. #3) - Black & Violet, Black & Purple. 50 C. (1879 - Sc. #4) - Black & Blue. 01 F. (1879 - Sc. #5) - Black & Red. 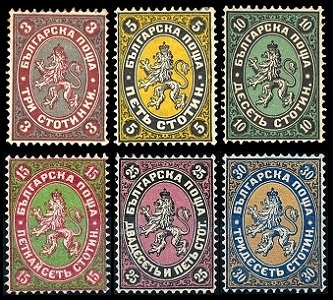 The six definitive Bulgarian stamps shown above were issued on April 10, 1881. They are typographed on laid paper that is watermarked wavy lines and Cyrillic letters in the sheet. These definitive stamps are denominated in Stotinki (СТОТИНКИ). 03 S. (1881 - Sc. #6) - Red & Silver, Deep Carmine & Gray. 05 S. (1881 - Sc. #7) - Black & Orange. 10 S. (1881 - Sc. #8) - Black & Green, Black & Deep Green. 15 S. (1881 - Sc. #9) - Deep Carmine Red & Green, Carmine & Pale Green. 25 S. (1881 - Sc. #10) - Black & Violet, Black & Purple. 30 S. (1881 - Sc. #11) - Blue & Fawn, Deep Blue & Brown. 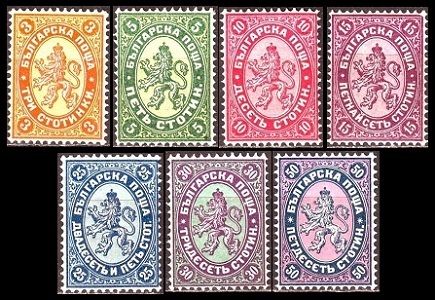 The seven definitive Bulgarian stamps shown above were issued on December 4, 1882. These new issues featured new denominations and colors. They are also typographed on laid paper that is watermarked wavy lines and Cyrillic letters in the sheet. 03 S. (1882 - Sc. #12) - Orange & Yellow. 05 S. (1882 - Sc. #13) - Green & Pale Green. 10 S. (1882 - Sc. #14) - Rose & Pale Rose. 15 S. (1882 - Sc. #15) - Red Violet & Pale Lilac. 25 S. (1882 - Sc. #16) - Blue & Pale Blue. 30 S. (1882 - Sc. #17) - Violet & Green. 50 S. (1882 - Sc. #18) - Blue & Pink. Shortages of some stamp denominations necessitated the overprinting and revaluation of supplies of other denominations. 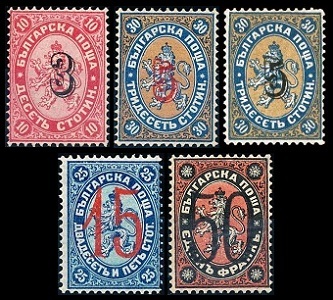 The five definitive Bulgaria stamps (and their varieties) shown above were overprinted and revalued during 1884 and 1885. 03 S. on 10 S. (1884 - Sc. #19) - Rose (Black). 05 S. on 30 S. (1884 - Sc. #20) - Blue & Fawn (Carmine). 05 S. on 30 S. (1884 - Sc. #20A) - Blue & Fawn (Black). 15 S. on 25 S. (1884 - Sc. #21) - Blue (Carmine). 03 S. on 10 S. (1885 - Sc. #21B) - Rose (Black). 05 S. on 30 S. (1885 - Sc. #21C) - Blue & Fawn (Violet). 15 S. on 25 S. (1885 - Sc. #21D) - Blue (Violet). 50 S. on 01 F. (1885 - Sc. #22) - Black & Red (Black). The two definitive Bulgarian stamps shown above were issued on May 25, 1888. These new issues featured new denominations. 01 S. (1885 - Sc. #23) - Gray Violet & Pale Gray. 02 S. (1885 - Sc. #24) - Slate Green & Pale Gray. 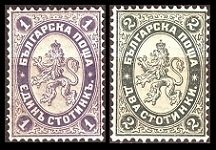 The three definitive Bulgarian stamps shown above were issued in 1886 and 1887. These new issues featured two inscription changes (underneath left star) and the first 1 Lev denomination definitive stamp. 01 S. (1886 - Sc. #25) - Gray Violet & Pale Gray. 02 S. (1886 - Sc. #26) - Slate Green & Pale Gray. 01 L. (1887 - Sc. #27) - Black & Red.